The Mesites are a special family of three distinctive species found only in Madagascar. Taxonomically they are considered a member of the Gruiformes -- the crane and coot order -- but they are distinctive relict birds. All three are ground-dwellers, running through their habitat like a cross between a rail and a thrasher. Restricted to the dry spiny desert of the southwest is the Subdesert Mesite (left), sometimes called the Monias. Dee (1986) summarizes this way: "This extraordinary bird occupies a monotypic genus in an endemic Madagascar family of little obvious affinity, both of whose other members are under threat." The Monias is a gregarious bird, living in groups of 4-10 on the ground, twitching their tails as they hustle through the undergrowth. The older literature stated they never left the ground, but Langrand (1990) noted that "if alarmed group remains close, all members running swiftly. To escape sudden danger, one bird may decide to fly a few meters to perch on low horizontal brach and may occupy new spot for several minutes." That is exactly what the bird above left is doing; frightened by the locals who were "herding" the family group to our tour, this individual flew to this position and "froze" for the next ten minutes, permitting photos but allowing the rest of the group to "escape." "Herding" of small parties by local guides is also how our tour group saw the White-breasted Mesite Mesitornis variegata in the dry deciduous forests of the northwest. I have an awful shot of one of those dashing through the undergrowth, so badly out of focus that I dare not even reproduce it on my own web site, but there are wonderful photos of this globally threatened species in Morris & Hawkins (1998). The final species is the Brown Mesite (right) which lives in wet rain forests of the eastern escarpment where "this secretive species is more easily heard than seen" (Morris & Hawkins 1998). On our first day at the new reserve at Ranomafana (misspelled on my field sketch), Rita & I chose to bird alone in this spectacular jungle, not realizing that the tour-guides were planning to use tapes to lure a Brown Mesite into view. Oblivious to the loss of this chance to see such a secretive bird, we birded out way quietly along a trail up the spine of a steep mossy ridge when I noticed movement to our right. Training binoculars downslope, we watched a pair of quiet Brown Mesites foraging and almost walking right past us. I was so jazzed with our good fortune that I drew this field sketch that evening. The most recent summary of information on this family (Evans et al. 1996) says that the "origin and nearest relatives of the mesite family remain mysterious." They note that early workers had associated them with pigeons, and then with pheasants, and even with the dippers! No fossils have ever been found, but the family is considered ancient in origin. Among oddities in this group are 14 (rather than 12) rectrices in a long broad tail, the small head, and very thick and extensive undertail coverts that "give an almost cylindrical look at times" (ibid.). Comparatively little is known about their basic biology or ecology. Like Madagascar itself, they are odd, remote, and mysterious birds. Photos: The Subdesert Mesite, or Monias Monias benschi, was photographed near Ishfay, north of Tulear, southwestern Madagascar, in Nov 1992. 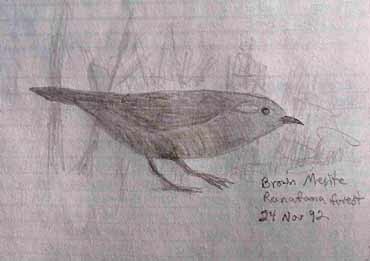 The Brown Mesite Mesitornis unicolor sketch was made on the day of observation in the Ranomafana Reserve, eastern Madagascar, on 26 Nov 1992. Photos & art © Don Roberson, all rights reserved. Family Book: There is no "family book" per se of which I am aware. 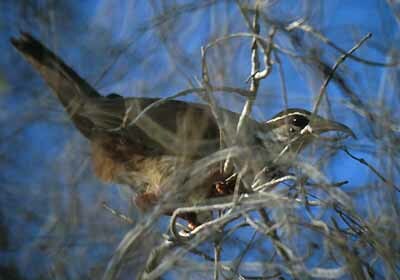 Good photos of all three mesites are in Morris & Hawkins (1998), and their habitats covered by Dee (1986), but a complete family introduction, with some superb photos (e.g., Brown Mesite at nest) is in Evans et al. (1996). Dee, T. J. 1986. The Endemic Birds of Madagascar. Intern. Council for Bird Preservation (ICBP), Cambridge, U.K.
Evans, M. I., A.F.A. Hawkins, and J. W. Duckworth. 1996. Family Mesitornithidae (Mesites) in del Hoyo, J., Elliott, A., & Sargatal, J., eds. Handbook of the Birds of the World. Vol. 3. Lynx Edicions, Barcelona. Langrand, O. 1990. Guide to the Birds of Madagascar. Yale Univ. Press, New Haven, CT.